Visitors to Israel wanting a glimpse of Jewish rural life 1500 years ago should make a trip to Katzrin Park, a reconstructed Talmudic village on the outskirts of the modern city of Katzrin, the unofficial capital of the Golan Heights. Beginning in the third century A.D., Jewish farmers built about twenty-seven villages in the fertile area northeast of the Sea of Galilee. One of the most important villages was Katzrin, located above a still-active spring. In the sixth century, residents of Katzrin built a magnificent synagogue over the ruins of their earlier place of worship. 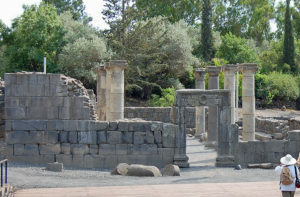 Like the other buildings in the village, the two-story synagogue, with two rows of columns, was erected from basalt, a volcanic rock found throughout the area. Katzin and its synagogue were destroyed in 749 by a massive earthquake and the village was eventually buried and forgotten. The ruins of Katzrin came to light in 1967 during Israel’s Six-Day War and its ancient synagogue was soon uncovered. Archaeologists began restoring some of the buildings. Today about ten percent of the original village has been excavated and is open to the public as an open air museum. Some of the buildings, including a two-story house with a sleeping room upstairs, have been completely restored and appointed with period appropriate furniture and supplies. Although the synagogue, popular for weddings and bar mitzvahs, has been only partially restored, visitors looking at it through a special viewer can envisage its original design. Costumed guides speaking English and Hebrew are happy to describe Katzrin’s history and buildings. An ancient wine press and olive press are again operable and demonstrations of wine and olive oil making are available in season. With the same ticket, visitors can explore a museum in modern Katzrin displaying archaeological discoveries from throughout the Golan Heights.